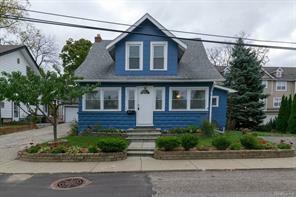 Charming home situated just before the bridge to Park Island. Fun year round as the lake is just across the street. Enjoy 4th of July and and great Lake Orion fireworks from your home.. Short walking distance to town for the festivals, great restaurants and fun! This home is loaded with character which includes beautiful craftsman style woodwork, including built -in cabinetry, hardwood flooring upstairs(under carpet), and some original windows. Nice floor plan with great family room, dining room, and large "eat in" kitchen. Head upstairs to 3 good sized bedrooms. Front bedroom could also be an office to enjoy the beautiful lake views.Many updates such as, new furnace, air, HWH, stainless steel appliances. Great basement for storage and lot offers ample parking.Welcome Home!